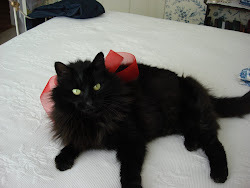 With Halloween approaching, I must confess--I didn't put up my decorations this year. I know, not like me, but it just seemed to get here before I knew it. So today, I am showing my cousin's decorations (actually from last year, but don't tell, no one will know the difference) and they look quite cute. This cute little cupboard is all decked out for the big night. 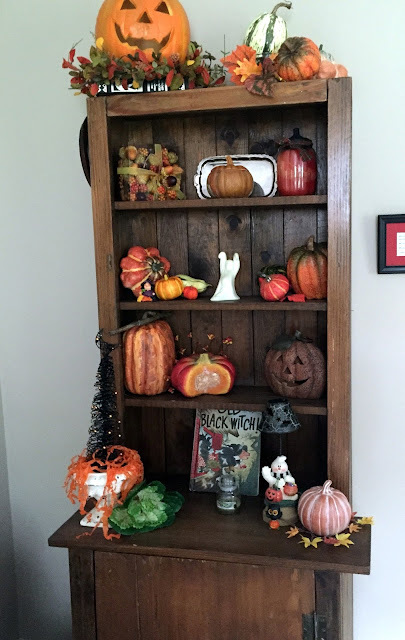 When Halloween is over, she merely turns the jack-o-lanterns around so the faces don't show, and they are just pumpkins, which can go on until after Thanksgiving! 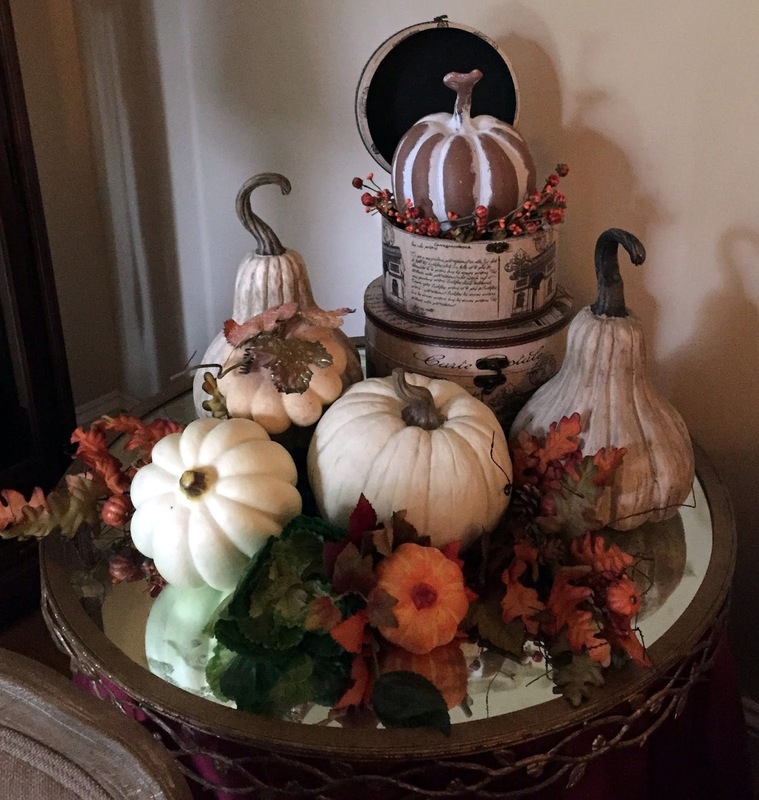 This beautiful fall arrangement sits on her round table in the living room. The dining room sideboard is decorated with fall leaves, mercury glass pumpkins, and a cute little witch. 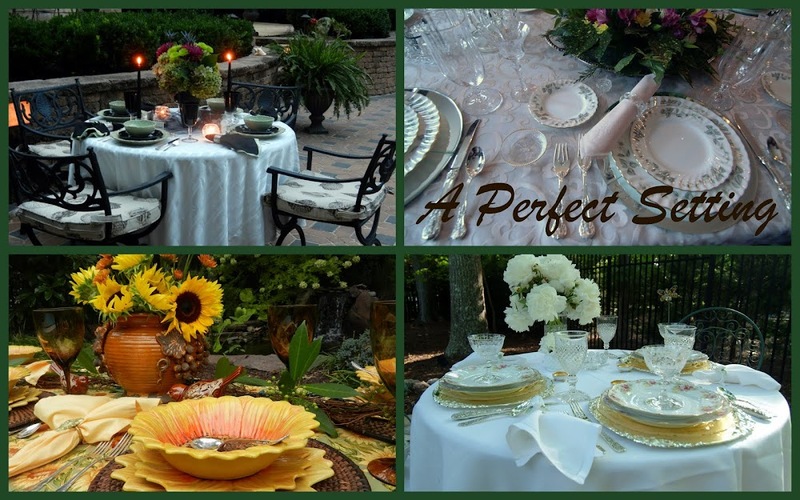 The centerpiece on the table makes a stunning presentation with lots of gourds, pumpkins, leaves, etc. The fireplace mantle is all lit up, with orange, purple, and green lights, a fall garland, and other Halloween decor. The wreath on the mirror is adorable. 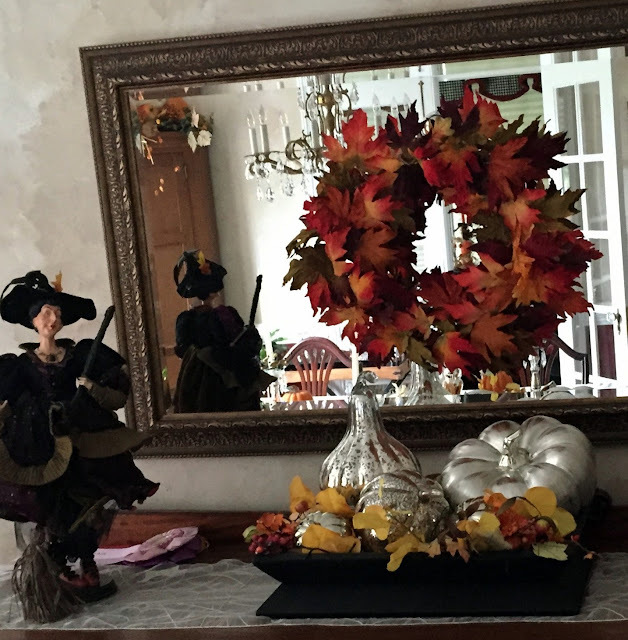 The mercury glass pumpkin reflects the light, which in part is due to this mirrored tile. Cute little votives! With six grandchildren, she always seems to have great help from one of the girls! 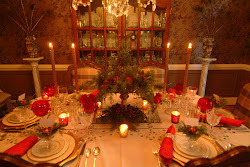 This is a closeup of the arrangement from the dining room. A jack-o-lantern dressed up for the occasion. Time to peace out. I'm thinking ahead to Christmas. Thanks for stopping by! 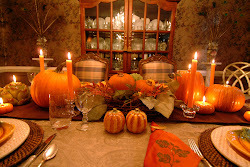 If you haven't seen my Halloween post, A Ghoulish Setting, click here. Gorgeous Fall/Halloween decorating. I especially like your dining room table all decorated! Cute witch too! She did a great job with her decorating. I like the idea of turning the pumpkin faces around to they're just pumpkins for after Halloween! The center arrangement on the table was beautiful! I hope all is well with you. Have a fun Halloween!